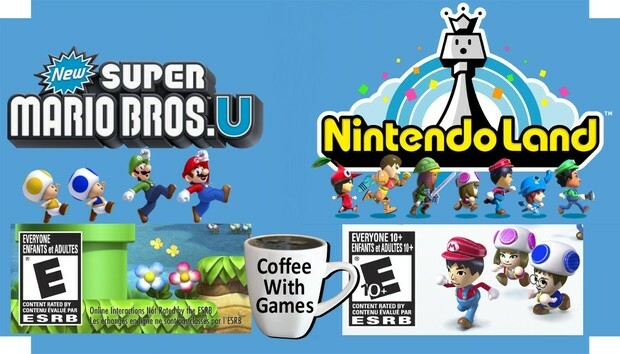 Community Blog by coffeewithgames // New Super Mario Bros. U with online multiplayer? "Online Interactions Not Rated"
Why do I think New Super Mario Bros. U might have a form of online multiplayer, outside of just Miiverse communication? Brew yourself some coffee, take a look at the images below! 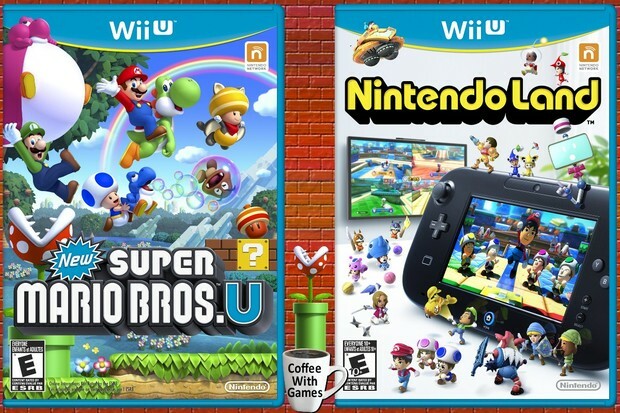 Look at the two boxes for New Super Mario Bros. U and Nintendo Land in the image above. Do you notice anything different between the them? If not, take another look. So, why would one box have the text, and not the other, if it is just talking about Miiverse? At the Wii U Preview event in September, Nintendo's Bill Trinen said of Miiverse, "...we're gonna go into more detail on Miiverse in New Super Mario Bros. U and other games, as we get closer to launch." 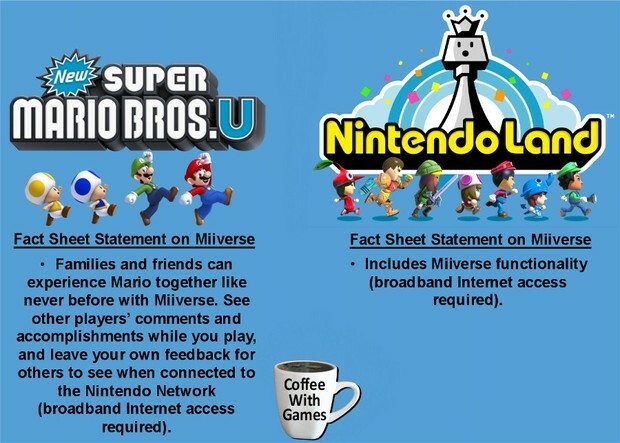 Again, we know that both New Super Mario Bros. U and Nintendo Land have Miiverse functionality, according to Nintendo representatives' statements and the official Nintendo fact sheets for both games. You can see the statements from the Nintendo fact sheets for both games in the image below. If you are still haven't spotted the difference, look to the right of the ESRB's "E" logo on NSMBU's box. The small black text next to the ESRB rating says, "Online Interactions Not Rated by the ESRB". Not just in English either, "Les �changes en ligne ne sont pas class�s par l'ESRB". The image below shows it up close, and personal? Why does New Super Mario Bros. U's box have that extra text, but Nintendo Land's box doesn't? The fact sheets for both game specify Miiverse functionality, so if the text is only for the Miiverse functionality in New Super Mario Bros. U, is it a lot different from what is being offered with Nintendo Land's Miiverse functionality? I think it's interesting that both games feature Miiverse, and both boxes have the Nintendo Network logo on them, but only the NSMBU box has the text specifically about online interactions. Perhaps the Miiverse interactions allowed in New Super Mario Bros. U will be different from those allowed for Nintendo Land? Maybe Nintendo is trying to change the standard "online multiplayer" lingo, to a Wii U console specific "Online Miiverse" lingo for future marketing reasons? Knowing how Nintendo has been pretty careful with what they are saying about the Wii U and even certain games being developed for it, gives me slight hope that they are preparing one last big Wii U online details reveal. I hope they detail the key features of the system such as Miiverse, multiplayer, patching, eShop prices, accomplishments, the friend code situation, and things like video chat and voice chat features. 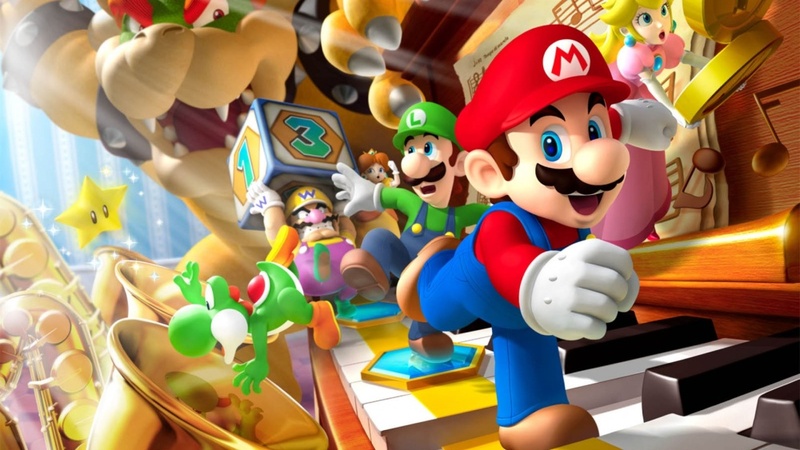 Having games to demonstrate the online functionality live, or even in a pre-recorded video, like New Super Mario Bros. U, I think would help cement buyers' decisions, and perhaps even make the console more appealing to gamers currently sitting on the Wii U fence. I hope that New Super Mario Bros. U features some form of online co-op, or even a Mario platforming multiplayer battle mode of some sort. Even if it doesn't though, I already have NSMBU pre-ordered (for Bean 1, our oldest son), so we should be playing it together as a family this holiday season at the very least, and maybe even with some of you if there is online multiplayer of some sort in the game. 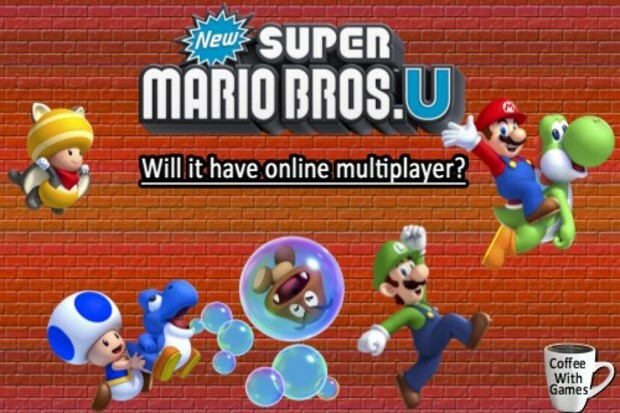 Do you think that Nintendo has perhaps kept online multiplayer for New Super Mario Bros. U a secret this entire time, waiting to tell us all about it when they detail more of the Wii U's online capabilities and Miiverse features within the next few weeks? If you haven't decided on buying a Wii U system yet, would New Super Mario Bros. U having online multiplayer help you make your decision? Are there any Wii U online features that could still be revealed, helping to push you toward getting the system if you still aren't sure about it?